Pizza never tasted so sweet! Angelo’s Pizza is one of the most famous pizzeria’s in Wilkes-Barre. Located on Hazel Street, Angelo’s is known for their delicious sweet sauce. This small pizzeria is often busy, so calling ahead is the best way to go. 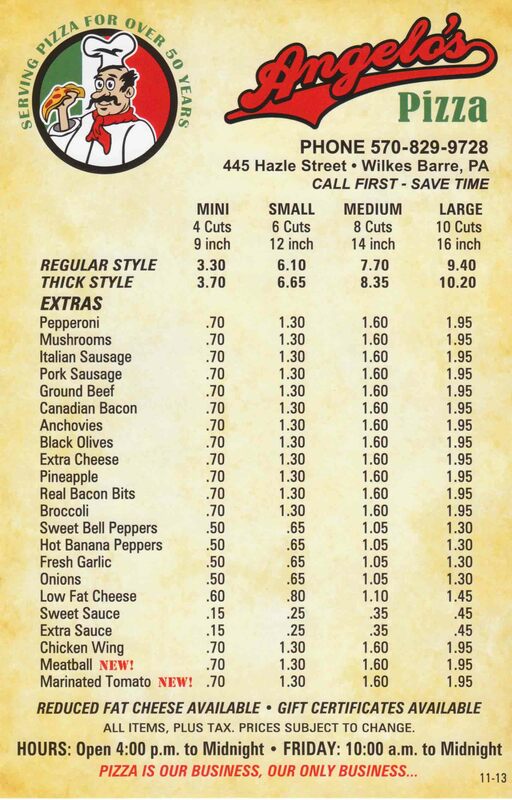 While they don’t sell pizza by the cut, Angelo’s offers great prices for small, medium and large pies! Angelo’s has many different toppings for you to choose from. We recommend the extra sweet sauce and thick crust!